Subtle differences in drawing and shading techniques allow artists to create a wide variety of landscape textures, from lush grasses to smooth stones. 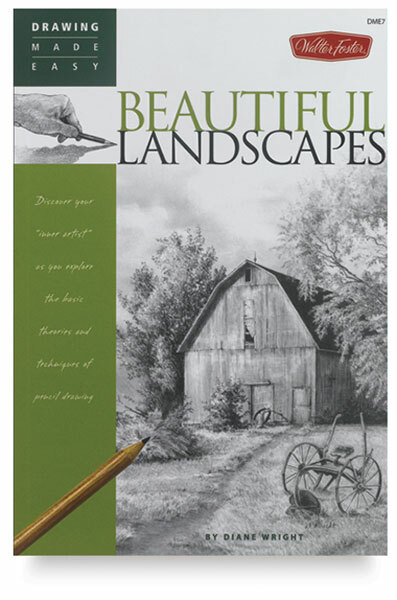 Beautiful Landscapes from Walter Foster's Drawing Made Easy series offers in-depth information on drawing landscapes in varied locales. Accomplished artist Diane Wright guides readers through the fundamentals of drawing in pencil, such as making basic strokes and using photo references, and on through 10 step-by-step projects featuring everything from a desert scene to a riverside landscape. As an added bonus, the book showcases landscapes from around the world, including scenes from Venice, the Netherlands, and Canada. 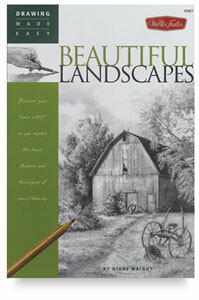 With easy-to-understand information on tools and materials, basic strokes, shading techniques, and more, this book covers everything aspiring artists need to know to start creating their own masterful works of landscape art. Diane Wright received a bachelor's degree in fine art with a teaching certification from the University of Northern Iowa in 1981. After a break that lasted more than 20 years, Wright picked up her art pencils again in 2002. During this break, she devoted her time to her family and building a career in computer technology. Wright now spends her free time re-exploring her love for art. She keeps busy with creating commissions, selling her artwork on her website, building online tutorials, and conducting drawing classes. She also offers printing services for graphic artists. Wright lives in Mitchellville, Iowa.